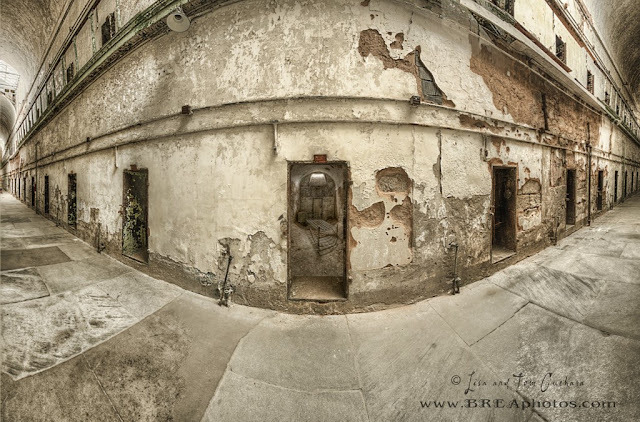 After being inspired by Tony Sweet at the recent Triple Header in Hamden CT I had to try out a long hallway at Eastern State Penitentiary (ESP) for a panorama. -- I took 9 sets of 7 images from the hallway (3 left, 3 right and one head on) at 17mm, my back against the wall and then 2 sets of 7 images inside (21mm) from the doorway. I HDRed the 2 sets of 7 images into two images and then merged them into one. I HDRed the 9 sets of 7 images into 9 images and then merged them into one. Then I masked the 14 image composite into the doorway. Then I applied Nik midnight and detail extractor. I cannot wait to go back and try again! We are leading a workshop to Eastern State Penitentiary on Sept 21st and we will have the entire place to ourselves before the public arrives.